Home Date Interview Questions Medium Date Questions How to get day name of given date in Java? Write a program in Java that prints day name of given date. 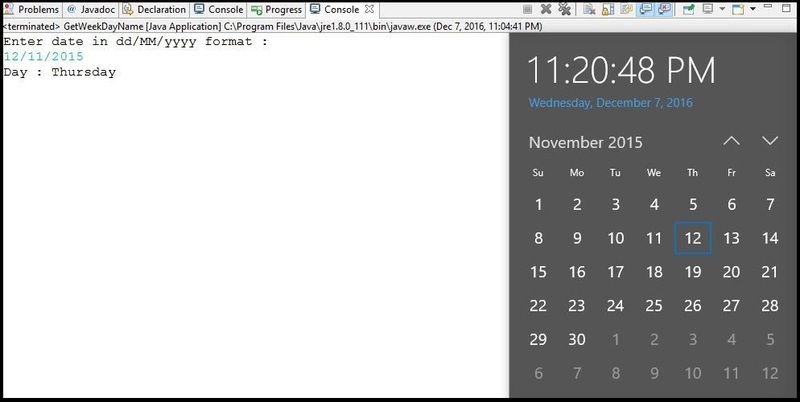 We are using below method of Calendar class that is present in java.util. * package. public int get(int field) -> In this method we have to pass Calendar class constant DAY_OF_WEEK and finally this method returns one value from 1-7. After that using switch case we are printing day name. How to convert Date to Calendar ? * @problem How to get day name of given date? // Converting Date to Calendar. 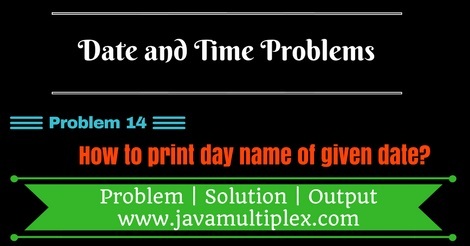 Output - How to print day name of given date in Java? Tags : Date and Time problems, Get day name, Solution in Java, String, Regular expressions, DateFormat, SimpleDateFormat, if else statement, switch statement, Calendar.